Lama Zopa Rinpoche at Chenerzig Institute, Eudlo, Australia, June 2018. Photo by Ven. Lobsang Sherab. 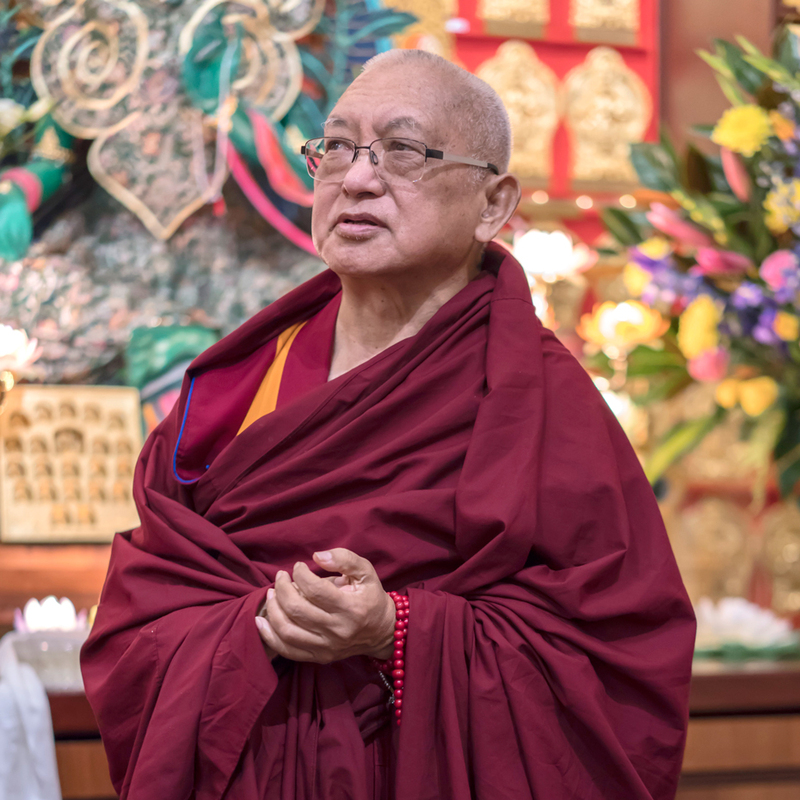 Lama Zopa Rinpoche offered this advice during a teaching at Chenrezig Institute in June 2018. There are so many wars. Hundreds of thousands get killed again and again. So many people get killed by bombs. Then so many people escape, then the boat is full, then sinks in the ocean. They try to run away, they can’t do anything: it is unbelievable. The people in the world are suffering. Syria is one example. It originated from one person not understanding that all came from his mind. Not understanding that the creator is one’s own mind. Can you imagine it? Millions and millions of people killed by the one person who has power, who did not realize this. Your mind is the creator of everything, all the suffering and all the happiness. That person didn’t realize that, thinks all is coming from outside. So that is an unbelievably important education to help the world, to help to bring peace and happiness in the world. So therefore we need Dharma centers giving teachings. Lamrim teachings, yes, but what it is all about is compassion. Teaching compassion, to practice compassion with sentient beings. With whom you practice compassion, with whom you generate compassion is sentient beings. That is the essence of Buddhism, the Buddha’s teachings—to generate compassion not only to human beings, but to every single hell being, hungry ghost, animal, the tiniest and the big, like whales living in the ocean, the worms living under the earth, also the tiniest flies, which when you walk in the grass they run, jump away. There are numberless universes so there are numberless human beings, numberless sura beings, asura beings. Compassion to everyone—that is the essence of Buddhism. What differentiates it from others is that. To everyone, any sentient being, to have compassion, to never give them up, to have compassion for them. Compassion means to not harm, and on top of that, if you can, to benefit. The motivation is compassion. If you want to practice Buddhism, you understand the conduct is to not harm sentient beings. And that comes from the right view, dependent arising, subtle dependent arising, which is unified with emptiness from its own side. The conduct comes from there—to not harm and to benefit sentient beings. That is often what His Holiness says. Now you can see that teaching Buddhism, through a course, or just talking about Buddhism to somebody, to explain compassion is the most important part. A long time ago a million children were dying from no food in Africa—so much suffering, no rain coming, no water, drought. And even when the crops were there, suddenly a flood came and they were destroyed. So I thought to help. I thought first maybe to invite some lamas, some monks, to make it rain in Africa. I thought to invite them. Then I thought our students—here there are old students, Roger and Paula. I thought maybe to send them there to make it rain. I translated lutor, Torma Offering to the Nagas, a long time ago. I didn’t translate it, I gave it to a Tibetan boy, a young man, to translate. He was a disciple of Tara Rinpoche. He translated it, and then I lost it. Then Paula found the translation in the Vajrapani Institute office. Then as it is advised there, she went to the mountains and did the puja to the nagas to make it rain. Then the rain did come, I heard that. So I thought to send them to make rain. I also thought to invite lamas, monks there. I would sponsor them to make rain and then they would do puja to make it rain. But if the people don’t have good karma, it won’t work. If the people don’t have good karma, it won’t rain. To receive rain, it depends on having good karma. For everything, if it is happiness you have to have good karma. If you don’t have good karma, then you have to create good karma. Then you will achieve that happiness. You will experience it. You have to work through that. People have to create good karma. So, how to do that? I was thinking about how to do that. I thought maybe I would go there, make friends with somebody in Africa. Talk about compassion to that person, so then that person is able to understand, then he can talk to his best friends about compassion, then they practice compassion. So little by little, three, four, five, then ten, like that, gradually, you talk about compassion, then they practice compassion, helping others. It doesn’t mean only people, but any sentient being. You practice compassion, to not harm and to help. So more and more people do that, and slowly it spreads, the positive actions, creating good karma. Then you make puja, a naga puja or whatever, then the rain will come. You need to start like that. First you lead them in how to create good karma. You have to educate them to practice compassion. You need to do that a lot in the world. That is the most important thing, the most important education, the most important meditation to make the human being better, a better human being. To not become the cause of, to not become the creator of problems and suffering for yourself. You are human being this life, so don’t become a creator of problems in the world. To not become a creator of problems to all sentient beings, to the people in the world, to yourself, to your family, practice compassion. Then you become more and more a creator of happiness, peace, for you, your family, then your country, the world, all sentient beings. I thought like that but, sorry, I myself didn’t get to go there, to start like that. So that’s what we need: teaching Buddhism, teaching Buddhadharma, establishing a center—a place where sentient beings can come to learn Dharma, to meditate, to purify and collect merits, to have realizations, a place where sentient beings open their minds, open their closed minds. The phenomena that they don’t see, to which they are closed, they become open to see all those phenomena—reincarnation and karma, all the rest of phenomena. Sentient beings are suffering—so therefore, what is needed is teaching Dharma, even to start a study group, no matter where you are living in the world, to study. If you know some meditation, if you know lamrim, study it a little bit. Even just two or three people, to learn, to go through the lamrim, meditate and read and discuss is so important. So more people gain compassion. You aim for that. Not just learning to feed your intelligence, but to develop compassion. Your aim should be that: for you and also for other people to develop compassion. That is so good. It is so important. The more you learn compassion, then you give less harm to others, less harm and the more benefit to others. That is your source of achieving happiness up to enlightenment. It is the source of you achieving happiness up to enlightenment, for you and every sentient being; for you, and you cause that for every sentient being. Unbelievable. You can see now you have to think in this way, of the proper motivation to have Dharma centers. Compassion is the most important. Even a Dharma study group, even one person, even one sentient being, to open the mind, to learn Dharma, to awaken the mind, to wake up the sleeping mind, the ignorant mind, even to help one person, one sentient being, even that is so important, unbelievably important. Teaching compassion, that brings them to enlightenment. That makes them have the opportunity to achieve enlightenment, the final goal. Wow wow wow. 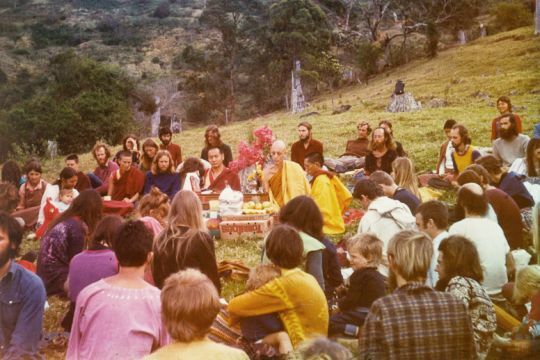 On the last day of the Diamond Valley course, Lama Yeshe and Lama Zopa Rinpoche, with their guest the English monk Phra Kantipalo, went with students to the land that would become Chenrezig Institute for an incense puja, Eudlo, Australia, September 1974. Photo courtesy Lama Yeshe Wisdom Archive. For example, Chenrezig Institute has benefited numberless sentient beings since it started. Since the beginning of the course in Diamond Valley* and up to now, so many sentient beings have come to learn Dharma, have come to meditate, have come to purify the cause of suffering, and create the merits, the cause of all happiness up to enlightenment—coming to Chenrezig Institute to learn Dharma, the whole path to enlightenment. Since the course in Diamond Valley up to now, so many sentient beings got benefit. They purified the cause of suffering, samsara and lower realms. It is amazing, amazing. So many practiced renunciation of the cause of suffering, renouncing attachment, renouncing anger, ignorance. So many, so many, so many practiced bodhichitta, even if they didn’t have the realization but did the meditation. So many created the cause to achieve nirvana, to be free, liberated from samsara. Sooooooooooooo many sentient beings starting from the Diamond Valley course up to now, so many created the cause to achieve nirvana, to be liberated from samsara. So many sentient beings meditated on, thought about, bodhichitta. They generated bodhichitta, even if it was not the actual realization. Every time they generate bodhichitta, it becomes the cause of enlightenment. Each time they generate bodhichitta, the cause of enlightenment, they create the cause to bring enlightenment to numberless sentient beings. That includes their own families, the numberless sentient beings, numberless hell beings, numberless hungry ghosts, then numberless animals, numberless human beings, numberless asuras, numberless suras, numberless intermediate state beings, to bring enlightenment to them. They created the cause of enlightenment from the Diamond Valley course up to now, wow wow wow. Just from Chenrezig Institute, so many. *The Diamond Valley course was the first Australian teaching event by Lama Yeshe and Lama Zopa Rinpoche. It took place August 30–September 28, 1974, in Diamond Valley, located not far the present-day Chenrezig Institute, in southeast Queensland, Australia.